"But the road, West, the road! winding round a prodigious mountain, and surrounded with others, all shagged with hanging woods, obscured with pines, or lost in clouds! Below, a torrent breaking through cliffs, and tumbling through fragments of rocks! Sheets of cascades forcing their silver speed down channelled precipices, and hasting into the roughened river at the bottom!" French mapping compares favourably with the best. The French equivalent of the Ordnance Survey, the Institute Géographic National, have the whole country covered in a number of different scales, including the orange 1:50,000 series, and the blue 1:25,000 series. The latter are also supplied in tourist editions for the major walking areas. The accuracy of the maps is reliable, and the presentation is excellent, with the subtle shadowing on the blue series being particularly useful, although the colours are a little more vivid than those used by the Ordnance Survey. 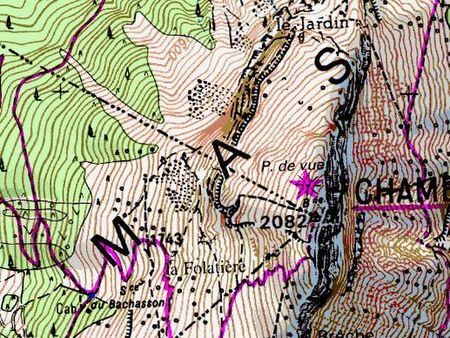 The Chartreuse area is covered by two special 1:25,000 IGN maps, 3333 OT, and 3334 OT, covering the north and south of the Chartreuse Massif respectively. These highlight the major footpaths, and are highly recommended. They are not expensive (about £13 in March 2019), and may be obtained locally, or from our Amazon shop. A waterproofed version is also available for about £15 (March 2019). The one serious criticism that has been levelled against these maps in the past, is that they have not been overlaid with a survey grid, making grid references difficult to use. However, since 1999, the TOP 25 walking maps are gradually being re-published with a kilometre square grid superimposed to make them more "GPS friendly". See below for further details. A digital version of the TOP 25 map for the whole of France is also available from Memory-Map for about £150 (April 2019). I find this invaluable for planning walks, and for tracing routes for this website. 1:50,000 geological maps are also available from the BRGM. These are expensive (€35.50 in June 2016), and four (748, 749, 772, and 773) are required to cover the whole of the massif. 748 is probably the most useful. One interesting variation on the theme of maps is a series of "Photoguides de Randonnée" published by the Société de Recherches et d'Etudes Aériennes. These are pamphlets containing aerial photographs of the hills with the main walking routes superimposed on them. They also include brief descriptions of the routes. Whilst being of little value as either maps or guides, they are an excellent means of getting across the salient features of the topography. There are five available in the Chartreuse series costing €7.63 for the set (July 2004), and if encountered, they should be snapped up. In recent years, a number of French walking guides for the area have been published. My favourite without doubt is Randonnées en Chartreuse by Pascal Sombardier, available for under £10. This is a splendid little paperback which covers some twenty of the best, but not too extreme, walks in Chartreuse. Each walk is beautifully illustrated with a clear sketch map and some excellent photos. It is strongly recommended, and if you are going to buy but one local guidebook it should be this one. Bear in mind, however that it covers the same ground as the walks on this website, and he avoids the more exciting bits. Another I am able to endorse is Chartreuse, Randonnées Pédestres Pour Tous", by Antoine Salvi available for about €9.45 (September 2002). This is a clearly laid out book which communicates the nature of the routes pretty well, and is also sensibly priced. Unfortunately, the print edition is now difficult to get hold of, but a web version is available. Also recommended, but not as a guide book for those who are on their first visit, is "Chartreuse - Vercors: Les Randonées du Vertige" by Pascal Sombardier (£22.37 in September 2012). This describes some of the more exciting walks as well as some of the local via ferrata, and includes some superb photographs. Another book by the same author, "Chartreuse inédite : Itinéraires Insolites", is also a must for the bookshelf, but has the same provisos. The latest addition to those available is "Chartreuse Secrète et Randonnées Sportive" by Jo Perez, published in 2008. This is a glossy softback rather expensively priced at £13.94 (September 2012). I have strong reservations about some of the routes that he selects, but they are complemented by a variety of interesting little essays about various aspects of the massif which make it worth buying. There is a selection of books available from our Amazon shop. Finally, you should also not forget that access to the Google Earth satellite photography is available both through the web and as a stand-alone utility. As mentioned above, the TOP 25 series walking maps are being republished with a kilometre square grid superimposed to make them more "GPS friendly". To use a GPS unit in conjunction with the map, first ensure that your map has the words "Compatible GPS" printed on the cover, which shows that it has the superimposed grid. You should then ensure that the grid of the GPS unit is set to UTM, and that the map datum is set to WGS 84. Note that the whole of Chartreuse lies in the UTM 31T zone.